Pictured is Andy Vallombroso owner and CEO of Andy’s Custom Bass Lures. 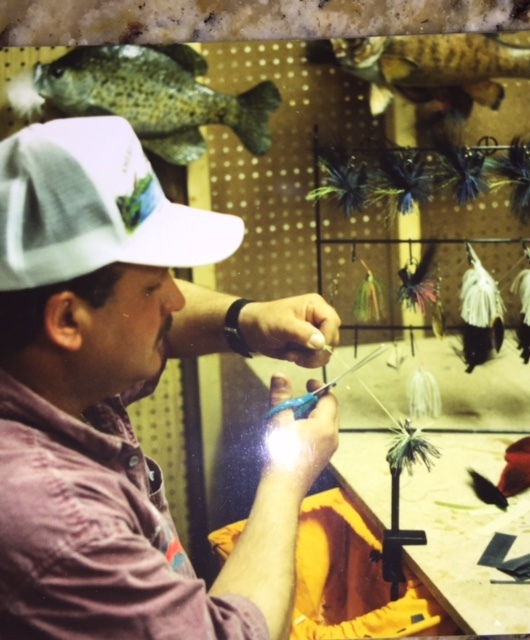 This picture was taken in 1981 showing Andy tying jigs and spinner baits with flat living rubber. Andy has been noted as one of the best Artists in designing and making some of the best and most realistic jigs in the world. In 2016 Edwin Evers won the Bass Masters Classic on a jig he and Andy designed specifically for the 2016 Bass Masters Classic. Also in 2015 Edwin Evers using one of Andy’s E-Series Synthetic Jigs in black won the Elite Series Tournament on the St Lawrence River. Andy is no stranger to tournament Bass fishing, he got his start fishing tournaments in 1979 and has won numerous tournaments in the USA. Due to Andy’s involvement in fishing competitively caused him to get the edge on his competition by designing some incredible jigs.